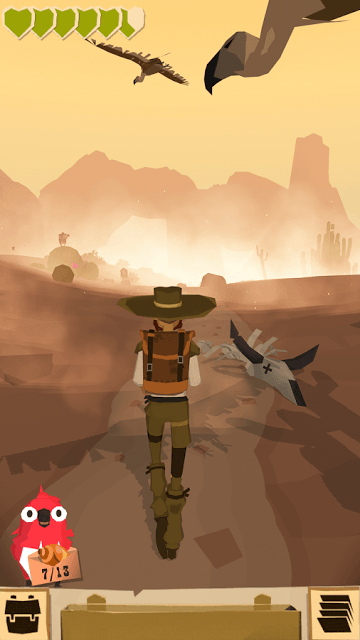 The Trail: A Frontier Journey is an explore and survive game developed by Peter Molyneux, creator of God games like Populous and Black & White. In this game, you step into the shoes of an adventurer as he explores the new world. The journey can be quite hectic and so you will have to help your traveler craft items, collect ingredients, join communities, trade items with other travelers, buy a house and finally marry someone. The game’s gorgeous 3D graphics will make you stop and look around, marveling at the bright and beautiful landscapes. 1. Press and hold the screen. Drag left and right to move the camera. You may have to move the camera quite often to look for items around you. Swipe up to start walking. Tap your character and drag up or down to control his walking speed. Drag up to make him walk fast/run. Drag down to make him walk slowly. 2. The heart at the upper-left corner of the screen is your energy. The faster you run (hold and drag up to run fast) the quicker the heart meter reduces. The heart decreases little by little when your character walks. It decreases fast when he runs. 3. Columns of smokes come from different campsites. You can rest at a campsite. Your energy is also restored. While walking and running, collect apples and other edible items. Eat them while traveling to replenish energy. Try to have apples when the heart is more than 50 percent empty. 4. Tap an item to collect it. To open your pack, tap the pack icon shown on the bottom left corner of the screen. Your pack has a convenient pocket. You can drag small items like shells to the convenient pocket. This will free some space in your pack. 5. You can examine an item by pressing and holding it. Tap your pack and then tap and hold an item to know more about it. 6. You can feed the bird an apple if he’s too hungry. Open your pack, press and drag an apple to Koko the parrot. 7. Raccoons are thieves, carry interesting items and hide everywhere. Drag the screen left and right to look for a raccoon around you and if you spot one, press the finger on him and swipe up to pull his tail. He will drop all items he has collected so far. 8. To collect new crafting recipes, talk to Beatrice, select a recipe quest and collect items for that quest. Koko the parrot will accompany you until you collect all items for a recipe. He will carry a signboard with him that will show how many items you have collected so far. When Koko whistles, it means that a quest item is nearby. Hold and drag the screen left and right to explore the area around you to find items. Items will usually have a slight glow around them. 9. To craft a recipe, tap the menu at the lower-right corner of the screen and press the crafting button (hammer, needle icon). Now move the items to the squares of a grid. Once you have dragged all required ingredients onto the grid, swipe down to pull the lever to craft an item. 10. You can craft shoes, clothes, new backpacks etc. 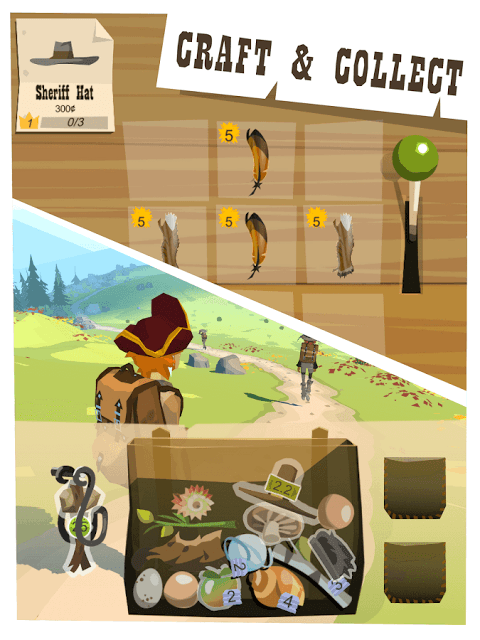 To equip them to your character, press the menu on the lower-right corner of the screen and tap the wardrobe (hat and clothes icon). You will find several slots having feet, hat, and backpack icons. To equip your character with shoes, just dragged them to the feet icon. You may tap and hold the shoes to check what benefits it will provide once he wears them. You can create high quality shoes and then sell the old ones. 11. Look for fellow travelers and follow them to a nearby camp. Maybe you can buy some items from them or sell them. You can start the trading game on a campsite. Now that you know how to play the game, let’s find out how to make the most of the trading mini-game, where to find some key items, how to eat, how to restore stamina and many more. Avoid walking at a brisk pace. Your character will run out of steam quickly if he runs or walks faster. While traveling between camps, he will lose more than 50 percent of his heart at a much faster rate if he walks faster. Things can become more difficult in areas where there is scarcity of food, such as the icy regions. So walking slow would be the first and foremost strategy to conserve energy. To decrease your character’s speed, you will need to press him and drag your finger down. To increase speed, drag your finger up. You should have more than one stamina heart if you want your character to safely travel from one camp to another. To get more stamina hearts, you can craft a new hat/headgear. You can collect blue feathers and then use them to craft hats. (More on blue feathers in the next tip). If your character goes down, then you will have a difficult time restoring his stamina. Always collect and carry food items whenever you spot them. Apples, berries nuts etc. will restore some stamina. If you want to restore more health, then stocking up on meat would be a wiser choice. To eat an edible item while walking open your pack, press and hold the food item. A knife and fork icon will appear. Tap it and your character will gulp it down. Once you buy a house, start buying those items that increase your character’s stamina. Clothes and footwear will help you decrease the speed at which your character’s health reduces. Moccasins, for example, will help your character walk faster and will reduce the speed at which your character’s stamina decreases while running/walking. Blue feathers can be used to craft hats, which not only provide more stamina, but can also be sold to get some money. At first you won’t get them easy, so find raccoons and swipe to pull their tails up and you may get some. You may also get them by watching those billboard ads. You can find lots of blue feathers if you wander to the third area, the White Mountains. While traveling, you may have noticed your bag turning red, and you may have always wondered why it does so. I may be wrong, but it may indicate that you are carrying too many items and it can’t have more items inside it. Or maybe it’s wearing out. Every wearable item is perishable and the number on it indicates how long it will last. A lower number shows that an item will wear out quickly. Say if the number is 4, then the wearable item can last only 4 kilometers. I would recommend crafting a new item to replace the old item when the number is less the 1 or 0.5. You can check each item’s number. Just tap the menu at the bottom right corner of the screen and then tap the clothes icon to find out how long each item will last. You can craft a new bag and then stack items of the same type by dragging them onto each other. This will free up some space. Also, don’t forget to move small items to the convenient pock located beside your backpack. We know the benefits of footwear and headgear. The latter provides extra hearts and the former can decrease the rate at which the stamina reduces while traveling. But what benefits do shirts and trousers/skirts provide? Now, it’s a fact that wearing clothes does have a positive effect on your character’s stamina. Shirts can help reduce stamina at a slower pace and pants besides their health benefit can also serve as additional storage options. Pants and skirts with pockets can be used to store small items, tools etc. which will free up some space from your backpack/convenient pocket. To put on clothes, tap and hold a wearable item to bring the tiny info screen. Now tap the shirt icon to wear that item. As you travel from one camp to another, you will come across several items lying here and there. Some will be quest items, others can be collected and used to craft tools that will help you fell trees. You will also come across edible items that can restore some stamina. Quest ingredients can be items for a new recipe. Once you complete a recipe quest, you will get to keep that recipe and you can again look for the same ingredients to craft the quest recipe item. Keep looking for quest items and Koko will help you by showing how many ingredients you have collected so far. The best part of collecting quest items is that they won’t clutter your backpack and use up space. Animal/ bird products, such as skin, feathers etc can be used to craft wearable items such as headgear, trousers, shirts, moccasins etc. They can also fetch a decent price. Example: The native hats made using feathers can be sold at a good price. Look for nettles. They can be used to craft shirts. Edible items like meat, apples and nuts can not only be used to replenish energy, but can also be sold at a decent price. However, I won’t recommend selling them as they can be very helpful to restore stamina because the distance you will cover will be very long once you unlock the second area.